The elegant façade of Commonwealth’s clubhouse provides a warm welcome to members and guests alike, whilst the well-appointed interior pays tribute to the club’s rich history and tradition without compromising all the modern comforts. Built in 1929, to accommodate the club’s growing membership, the clubhouse was officially opened by Lord Somers (then Governor of Victoria) on December 7 1929. In contrast to the first clubhouse, which was situated on Centre Rd near what is now the 3rd green and lasted less than seven years, the current one has stood the test of time. It was not until 1959 that substantial renovations were deemed necessary, and these were planned so as not to alter the original character of the building. The main requirements were to build a new pro shop, to create additional locker space, to expand the bar, to improve the manager’s office and committee room, and to enclose the balcony with access to the bar and dining room. Along with the Golf Shop and bar and dining facilities, the clubhouse features several dedicated spaces with the flexibility to accommodate group sizes ranging from 4 to 200, whether it be formal dining or a casual cocktail-style event or BBQ. 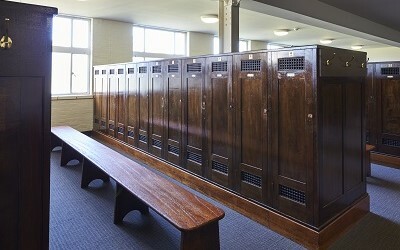 The Men’s and Women’s Locker Rooms contain beautiful wooden heritage lockers along with modern bathrooms and facilities to complement the on course experience. The clubhouse also showcases the original Honour Boards dating back to the club’s inception in 1920 as well as the heritage display of golf artifacts and club history.